Public participation is the foundation of our democracy. When community participation programmes are effective, the entire process is enhanced and the outcomes are always improved. They enable Council to understand and be responsive to the needs of Auckland’s communities. Community engagement has the ability to build networks, grow leaders, and introduce a more collaborative style of governance that encourages participation in the democratic process. However, when poorly managed, community engagement programmes can have negative consequences when efforts to engage are not followed through. This inevitably leads to disillusionment, increased apathy, and creates roadblocks for future consultation. 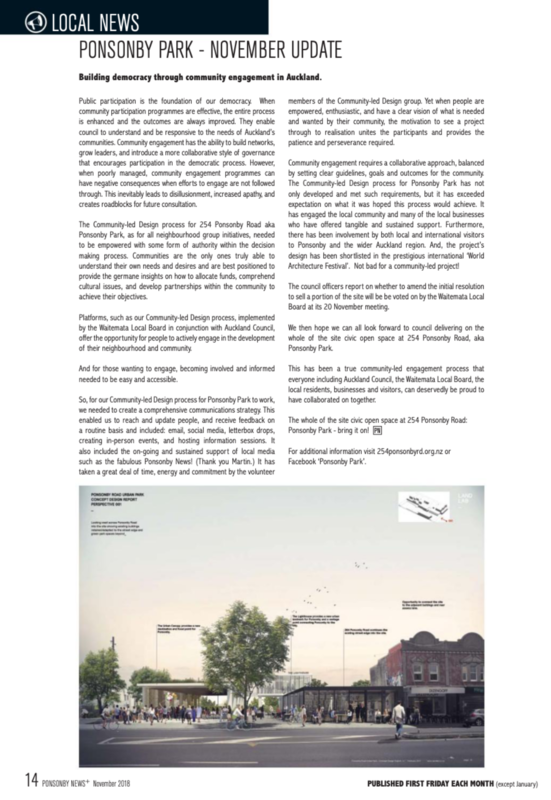 The Community-led Design process for 254 Ponsonby Road aka Ponsonby Park, as for all neighbourhood group initiatives, needed to be empowered with some form of authority within the decision-making process. Communities are the only ones truly able to understand their own needs and desires and are best positioned to provide the germane insights on how to allocate funds, comprehend cultural issues, and develop partnerships within the community to achieve their objectives. Platforms, such as our Community-led Design process, implemented by the Waitemata Local Board in conjunction with Auckland Council, offer the opportunity for people to actively engage in the development of their neighbourhood and community. And for those wanting to engage, becoming involved and informed needed to be easy and accessible. So, for our Community-led Design process for Ponsonby Park to work, we needed to create a comprehensive communications strategy. This enabled us to reach and update people, and receive feedback on a routine basis and included; email, social media, letter-box drops, creating in-person events, and hosting information sessions. 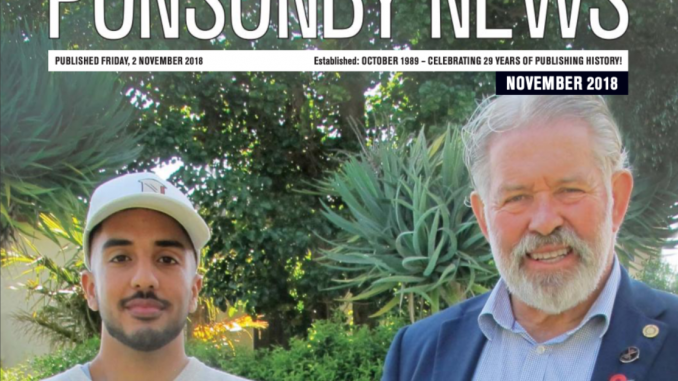 It also included the on-going and sustained support of local media such as the fabulous Ponsonby News! (Thank you, Martin). It has taken a great deal of time, energy and commitment by the volunteer members of the Community-led Design group. Yet when people are empowered, enthusiastic, and have a clear vision of what is needed and wanted by their community, the motivation to see a project through to realisation unites the participants and provides the patience and perseverance required. Community engagement requires a collaborative approach, balanced by setting clear guidelines, goals and outcomes for the community. The Community-led Design process for Ponsonby Park has not only developed and met such requirements, but it has exceeded expectation on what it was hoped this process would achieve. It has engaged the local community and many of the local businesses who have offered tangible and sustained support. Furthermore, there has been involvement by both local and international visitors to Ponsonby and the wider Auckland region. And, the project’s design has been shortlisted in the prestigious international ‘World Architecture Festival’. Not bad for a community-led project! The Council Officers report on whether to amend the initial resolution to sell a portion of the site will be voted on by the Waitemata Local Board at their November 20th meeting. We then hope we can all look forward to Council delivering on the whole of the site civic open space at 254 Ponsonby Road, aka Ponsonby Park. This has been a true community-led engagement process that everyone including Auckland Council, the Waitemata Local Board, the local residents, businesses and visitors, can deservedly be proud to have collaborated on together.